Canmore is utterly charming, cozy and the type of place you love to take your family. Travelers can expect to see local stores and restaurants while avoiding tacky touristy shops. . You can expect to save 20 to 30 percent on your hotel lodging as well. Canmore is a great Canadian Rockies destination on its own as well as an excellent base for additional Canadian Rockies travel to cities like Banff, Lake Louise, Johnston Canyon and other nearby towns. You can check out our Live Web Cam feed for Canmore, Alberta (the Downtown View)! You can check out our Live Web Cam feed for Jasper, Alberta. You can check out our Live Web Cam feed for Banff, Alberta. 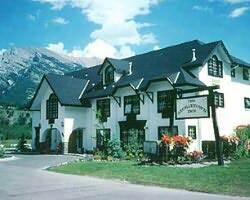 Beautiful Tudor English architecture in Canmore, Alberta. The perfect place in Canmore, Alberta for families! Silver Creek Lodge is one of Canmore, Alberta's most luxurious accommodations. This accommodation has everything you need when staying in Waterton National Park. Centrally located in the town of Waterton, Alberta! Guests drive a team of 6-8 dogs as you mush through the Canadian Rockies with our experts. Enjoy the amazing scenery of open meadows, snow-covered forests and frozen waterfalls. Jasper National Park's Athabasca River is the perfect family rafting adventure. A Canadian Heritage River because of it’s scenic beauty, the river is a perfect summer vacation stop for all ages. Check out what people are saying about the Banff Canmore Downtown Webcam! Would you like to sign the guestbook? It's simple and fast. Just click here and you are on your way. No way! A real camera? I’m spying on everyone in Canada!! It’s wonderful to be able to see downtown! Makes me miss Canmore. It was such a fun trip up there. It was so much fun using the webcam. We’re planning our vacation and it really helped me a lot. Look at the all the cool pictures of Canmore people are taking with the Banff Canmore Downtown Webcam! We want to see your pictures. Download all the Canadian Rockies Vacation Guides for FREE! Learn insider knowledge about the Canadian National Parks. CLICK HERE!